The distinctive taste of the full bodied South African red wine slips across the pallet as the sun descends slowly in the southern African skyline. 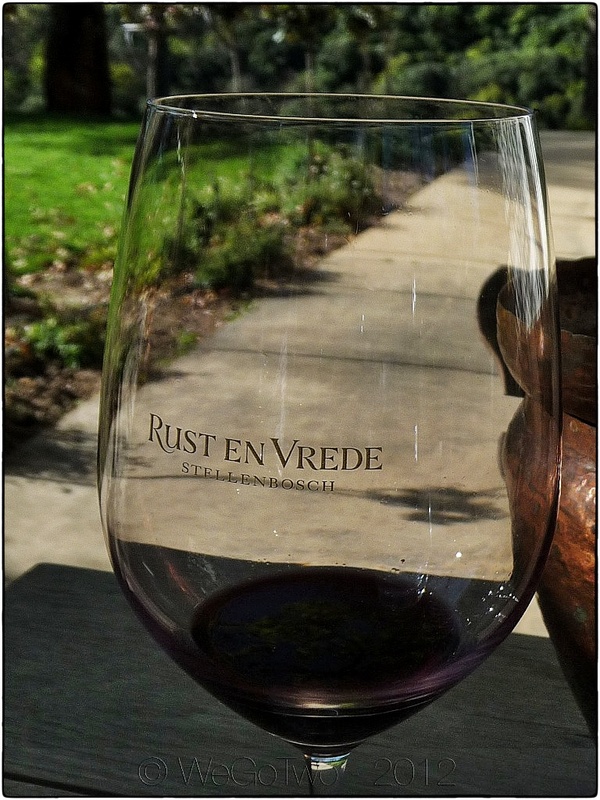 The stunning mountain range to the north towers over the Stellenbosch wine region and we soak it all up at the Rust En Vrede winery’s cellar garden. We have spent the day touring the Stellenbosch area – the pride of South Africa’s wine industry. Hundreds of wineries are dotted throughout the spectacular landscape and visitors to the area could spend days here soaking up the delights which the area has to offer. Whilst Stellenbosch is known for its spectacular wines, it is also home to a large university and a playground for outdoor enthusiasts. Indeed, one could stay in the region for a week and not get through half the wineries and activities. We just might have to come back! As our wine tasting comes to an end we reflect on the fact that “life is very good indeed”. This entry was posted on Thursday, September 6th, 2012 at 3:00 pm	and is filed under Africa, Cape Town, On The Road. You can follow any responses to this entry through the RSS 2.0 feed. You can leave a response, or trackback from your own site.